A lot of people inquire about using security window film on their buildings, but with the large selection of thicknesses, colors and types they don’t know which one works best. This article will help differentiate between the Safety window films available and when you should and should not use them. Standard security window film is used for mild to moderate glass protection. Many people are confused about the function of the films, however. Safety film will NOT prevent your glass from breaking in the event of an accident, such as a rock hitting it or someone trying to break in. 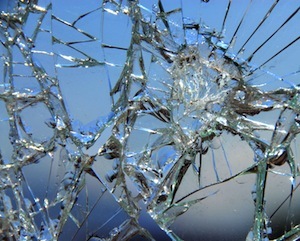 What the film WILL do is increase the amount of force it takes to break the window, and then prevents the glass from shattering into thousands of pieces all over the floor. In addition, if someone tries to break through the glass to gain entry, they will have a much harder time doing so. The film is much harder to penetrate or pierce with blunt or sharp objects. So, the thicker the film you install, the harder it will be to break in. Safety films range in thickness, typically from a 4-Mil Safety Film all the way up to a 15-Mil. For break-in prevention and mild glass protection, as described above, any film in the range of 4 to 7-Mil Safety Film will work just fine. You won’t really need to use anything thicker than that. Customers also ask about weather protection on storm doors and other glass, especially in areas that are prone to hurricanes. For this type of protection, thicker films will work better. Anything in the range of 8 to 12-Mil will provide adequate protection when strong winds or rain may send objects flying at glass. Again, this will not always protect the glass from breaking, but it will prevent it from shattering which can be especially dangerous during severe weather.